by THG Staff at March 13, 2019 4:03 pm . Updated at March 13, 2019 4:37 pm . As in... will Cassie and Colton ever get married? The aforementioned finale concluded without a ring on Randolph's finger, as Underwood convinced his alleged soulmate to give their romance another try -- with no proposal and no pressure. They're now just two regular people, in a very serious relationship, simply seeing what the future holds for them. Will it include a wedding, though? It almost never does, not for any couple who met via The Bachelor or The Bachelorette. This is why we had to ask members of The Hollywood Gossip for their opinion on the most pressing of celebrity gossip topics today: Is Colton still a a virgin? No, wait, that isn't it. WILL HE AND CASSIE GET MARRIED? It says a lot that Colton chose Cassie as the woman within whom he would bust the inaugural nut. But alas, that initial o-face may not be enough. Don’t get me wrong here. 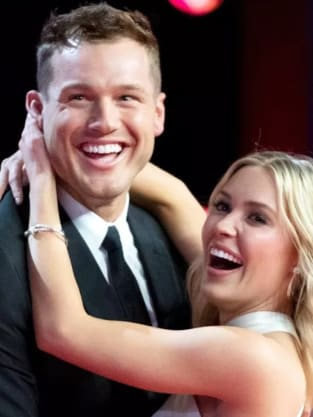 As Bachelor Nation couples go, Colton and Cassie probably stand a better chance of making it to the altar than most. His devotion to her was clear from the start. It was all about Cassie this season, and no competitors (or fences) were going to get in his way. Cassie needed more time, basically dumped him, and he still felt that he pretty much had to dispatch Tayshia and Hannah to pursue her. That level of dedication is not to be taken lightly. His v-card made for great television and many a terrible joke on this website, but he never struck us as a one-woman man. More of an opportunist. Ask his exes Tia Booth and Aly Raisman how they felt about his loyalty. Does he always have his eye on the future, or one foot out the door? There’s also just the plain fact that the aftermath is about to hit Coltassie hard. Gone are the helicopter rides and fantasy suites. Here are the real jobs. Well, maybe not. They’ll likely enjoy nice careers as C-level Instagram influencers earning fractions of a penny per click shilling for Hello Fresh. Nevertheless, they barely know each other. The show’s track record speaks for itself. Only ONE TIME in the previous 22 seasons has the star of the Bachelor wed his final rose recipient (Arie Luyendyk Jr. and Jason Mesnick went on to marry their respective runners-up, but that’s still a paltry 3-for-22 success rate). Long story short, it’s a hard road under the best of circumstances, and I don’t know that Cassie and Colton are starting in that position, nor am I sure they have the commitment to see this relationship progress into marriage. These two really went off-script this season. Cassie broke up with the hunky athlete after he told her that he would end the show for her. Then Colton shook, cried, and climbed over a wall in distress. Sure, he and Cassie did get together. They're together to this day, even though they're not engaged. But the reason that I vote "no" existed long before the finale. Maybe he had love-blinders on or maybe it's just his inexperience with romance, but Colton ignored a ton of red flags. Just about everyone warned him that Cassie was not there for the right reasons. We don't just mean Kirpa and Tayshia and Katie and Sydney and Demi and Hannah Brown. Cassie's own family seemed reluctant to encourage Colton to pursue her. They were dropping hints that he should let her go. For that matter, even Cassie seemed to be encouraging Colton to slam on the breaks. Plus, didn't we hear that both Cassie and Caelynn had spoken about becoming the next Bachelorette? That's not the dream of someone who intends to stay with Colton for keeps. There was something a bit … off about Colton’s season of The Bachelor. Yes, his virginity loomed over the proceedings from the first rose to the excruciatingly protracted finale. And yes, Chris Harrison waved Colton’s V-card around at every opportunity, thus making the whole thing even more awkward. But it wasn’t just Colton’s lack of fantasy suite experience that made this season stand out. No, this was a far more chaste and wholesome season in general. Sure, there was some back-biting among the ladies, but Colton seemed to gravitate toward women who shared his stringent moral values, and those were the contestants who hung around the longest. Which brings us to Cassie. Though not a virgin like Colton, she might have been the only cast member who was able to match him in terms or rectitude and righteousness. Cassie filmed another reality show before The Bachelor, and it was all about her Christian beliefs. Her dad refused to give Colton permission to propose, thus demonstrating a total lack of understanding of how the show works — as well as a bonkers level of commitment to his “traditional” values. As far as we can tell, Colton held on to his virginity for all those years because he was looking for a partner who could match his moral purity. And it looks like he’s found it in Cassie. Expect these two to get hitched and pop out roughly 1 million blonde babies. Trust me. I shocked myself with this answer. I'm someone who believes that true love cannot grow between two people while they're surrounded by cameramen and forced to recite cheesy dialogue during staged, not-really-romantic sunsets, hot air balloon rides or random concerts by really random artists who have a marketing deal with Disney. Many years of Bachelor break-ups have proven this theory correct. But Cassie and Colton actually went about things in a candid, raw - dare I say it? - realistic manner this season. Colton never pretended to be in love with multiple women at once; and Cassie didn't pretend to be cool with her quasi boyfriend kissing other women throughout the week. The latter was bothered by this fact, just like anyone would and should be, while Colton refused to even lead any other finalist on. This is a virgin (in case you hadn't heard) who could have finally ended his sexual drought by getting it on with two beautiful and very willing women... and he instead chose to send them home because his heart was set on Cassie. That's sort of, kind of, in its own way... beautiful, isn't it? It has to at least mean something that Colton was so sure about Cassie that he didn't even try and pander to ratings or viewers by dragging out his decision. And it has to at least mean something that neither Cassie nor Colton wanted to get married so soon after this charade of a relationship. They're willing to take their time and explore their feelings and aren't about to be influenced by Chris Harrison or a bunch of executives in suits or really anyone except for each other. For that reason, and also because they'd probably make millions off a televised wedding, I think these two will make it. DO YOU AGREE? WILL COLTON AND CASSIE GET MARRIED?